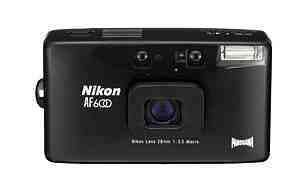 The Nikon Lite Touch AF (I’ll call it the AF 600 from now on, if you don’t mind) is, at first glance, similar to the Olympus Stylus Epic. They both have fast, non-zoom lenses, DX coding, active autofocus, and are about the same size. There are a couple of subtle differences. The Nikon shutter covers from 1/4 sec to 1/250th second. The Olympus covers an impressive 4 seconds to 1/1000th second, putting the Olympus on par with contemporary SLRs. The Nikon stops down to f/3.5, whereas the Olympus beats it by 2/3 stop, at f/2.8. That means the Olympus can gather 2/3s more light than the Nikon at their respective widest apertures. The Nikon wins at focal length – the Nikon has a wide 28mm lens, the Olympus comes in a bit shy at 35mm. The Nikon autofocus appears to be a single point active AF. To focus on a subject that’s off-center, you pick a spot and pre-focus, then re-compose the picture and shoot. An AF assist lamp lights to help in low light situations. There’s an infinity lock as well, for shooting distant subjects without waiting for auto-focus. The Nikon has a couple of interesting features. The self-timer has a 2-shot mode, with one shot at 10 seconds and another 10 seconds afterwards. Helpful if you want to get a second shot or not look out of breath from running into the shot. It also has a panorama mode, which I’m anxious to try out. I’ve tried panorama mode on cheap plastic cameras, want to try it with a “real” camera. The camera viewfinder has framelines for parallax adjustment and panoramic framelines. As with many point & shoot cameras, once you turn it on the flash is in “Auto” mode and ready to be used if the meter warrants it. You can easily turn this off with the middle button on the top of the camera. The Nikon offers slow sync and red-eye reduction modes. The Nikon and the Olympus can focus as close as 14 inches. With the slightly longer lens of the Olympus, you might get a little more “reach” with a macro shot. Min shutter speed 1/4 sec. Max shutter speed 1/25th sec. Hot shoe or pc sync No. Self timer One or two self timer shots at 10 second intervals. Viewfinder display Normal/panorama format, frame lines. Auto rewind Yes, with mid roll override. Est. battery life Approx 23 roll of 24 exp., 18 rolls of 36 exp.